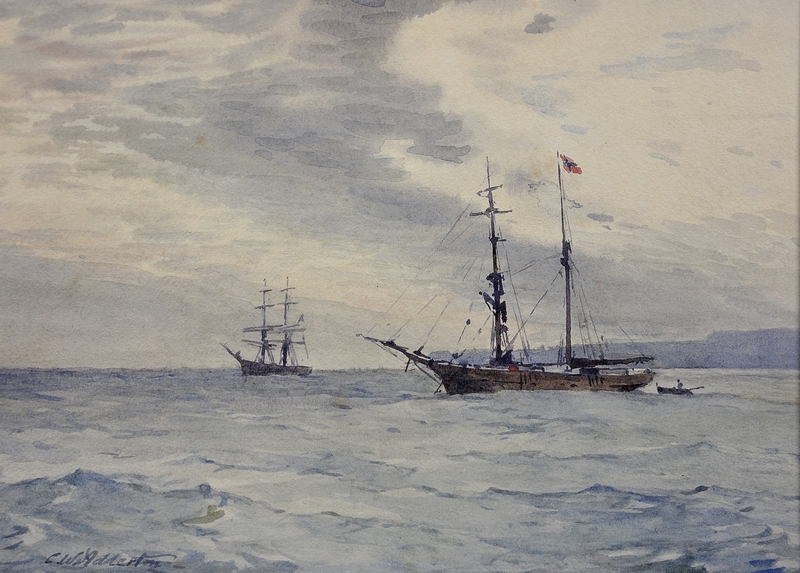 Charles William Adderton - Norwegian barques at anchor, Teignmouth and Shaldon - Online gallery supplying original fine art. Trending Modern British and Contemporary Welsh. Available for sale from Big Sky Fine Art; this original painting by Charles Adderton dates from around the turn of the century.<br> The watercolour is presented and supplied in a sympathetic contemporary frame, mounted using conservation materials and behind glass.<br> The watercolour is signed lower left. 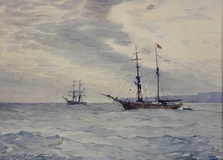 <br> <br> Charles Adderton was an accomplished landscape painter in watercolour. He was born in Nottingham in 1866, but spent periods of his life living in Nottinghamshire, Derbyshire and Yorkshire. He studied at the Scarborough School of Art under Albert Strange and had a studio in Scarborough in 1894, later living in Robin Hood’s Bay.<br> <br> In 1920 he was again in Nottingham where he exhibited a total of 226 paintings in the Nottingham City Art Gallery. <br> <br> Adderton had a reputation far beyond the Midlands however and he also exhibited in the leading London galleries from 1890, including 7 paintings at the Royal Academy, and others at the Royal Society of British Artists British Academy and the Royal Institute.<br> <br> He was a keen yachtsman and his landscapes included many coastal scenes. <br> <br> This original watercolour is a study in blues! It depicts two Norwegian sailing vessels, or barques, at anchor a short distance from the Devon coastline, near Teignmouth and Shaldon. The nearest vessel is flying the Norwegian flag on its main mast; the flag is red with an indigo blue Scandinavian cross edged in white. There are half a dozen figures on board the vessel, some attending to the rigging. There is a small rowing boar attached to its stern, with a single figure on board. There are no sails on the masts of either boat, and we feel that they are at rest. The sea is calm, a myriad of blues and purple greys, and the vast sky above echoes the colours between the white clouds. There is a slight swell on the sea, but the peaceful with a good sense of perspective. Available for sale from Big Sky Fine Art; this original painting by Charles Adderton dates from around the turn of the century. The watercolour is presented and supplied in a sympathetic contemporary frame, mounted using conservation materials and behind glass. The watercolour is signed lower left. Charles Adderton was an accomplished landscape painter in watercolour. He was born in Nottingham in 1866, but spent periods of his life living in Nottinghamshire, Derbyshire and Yorkshire. He studied at the Scarborough School of Art under Albert Strange and had a studio in Scarborough in 1894, later living in Robin Hood’s Bay. In 1920 he was again in Nottingham where he exhibited a total of 226 paintings in the Nottingham City Art Gallery. Adderton had a reputation far beyond the Midlands however and he also exhibited in the leading London galleries from 1890, including 7 paintings at the Royal Academy, and others at the Royal Society of British Artists British Academy and the Royal Institute. He was a keen yachtsman and his landscapes included many coastal scenes. This original watercolour is a study in blues! It depicts two Norwegian sailing vessels, or barques, at anchor a short distance from the Devon coastline, near Teignmouth and Shaldon. The nearest vessel is flying the Norwegian flag on its main mast; the flag is red with an indigo blue Scandinavian cross edged in white. There are half a dozen figures on board the vessel, some attending to the rigging. There is a small rowing boar attached to its stern, with a single figure on board. There are no sails on the masts of either boat, and we feel that they are at rest. The sea is calm, a myriad of blues and purple greys, and the vast sky above echoes the colours between the white clouds. There is a slight swell on the sea, but the peaceful with a good sense of perspective.